I really like Garageband iOS on my iPad. Lately it’s been improved to the point where the annoyance of not being able to do something critical has been replaced by the smaller annoyance of needing to learn where they have hidden how to do some things. Did you know that if you long press on the Undo button it pops up the option to Redo? Why would they hide that? There’s a perfectly good space next to the Undo button where a reversed arrow would have fit! Seriously made me mad, and now that I know, let me make you mad so it can stop driving you mad. And volume control. For ages I have battled uneven volume in a single track. Usually vocals where I just sing a few phrases with a little more gusto. The workaround was to pick a level in between that you could live with, or create another track and split the different volume tracks between them, louder clips on one with the main volume brought down, and then a boosted track to bring quieter audio up to balance. Now Apple has included Automation controls to add a volume level path to audio tracks as they play. I think Adobe used to call them rubber bands. This feature overrides your ability to use the regular volume slider, so get that about where you want it for the majority of your track first. Yes, this means you should already have a rough mix worked out, if you want to work more efficiently. To activate the Automation, you tap the instrument icon on the desired track, then the yellow lightning bolt type icon below it (reference the photo). This creates the first flat audio band, set to the current volume level. You can pull it up and down carefully and it will show you the decibel changes, but this pulls the straight line between points and doesn’t work in pencil edit mode. When you slide over the pencil lock control in the upper left into edit mode (bright red), you can tap on the line to create additional points, or long press on existing points to move them up, down, or sideways. Experiment on your own. Remember you need two points for a volume transition, but it can be a slow fade or really close together for a jump. (Great for taking down a sound without cutting the track apart. And remember you have Undo and Redo buttons when you screw up. You will screw up. TIP: Don’t try to swipe around in tracks to different parts of the song by touching the activated track. Just don’t. When done with the editing you can slide the pencil edit off. But you also need to click Done in the upper right to close the Automation control and get back to other controls. I used this feature extensively to mix and duck audio in the track I posted for my wife this Valentine’s Day. Hear my Simply Need song free on Bandcamp. It made it easier to get an acceptable mix under deadline and tweak things at the last minute. Enjoy your free time! Or use it to make more stuff, that’s cool,too. P.S. 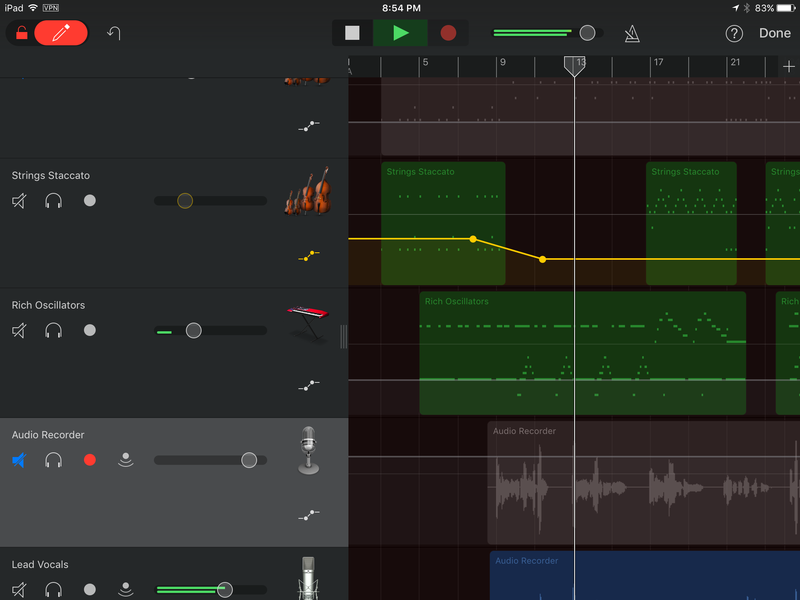 GarageBand is free if you bought an iOS device that runs it anytime in the last few years. Now if you want to convert it to another format, well, that requires a Mac since you can’t open or extract from the file on Windows. But using GarageBand on a Mac (also free, the software not the Mac) you can move it off the iPad and not have to keep everything you created on a device that might just die or get stolen one day! (Yikes! Lived that fear.) With Logic (about $100) you can work on your composition in a much more full featured (professional even) audio software tool. P.P.S. If you have a friend with a Mac and work in Windows, they can use Logic to actually unpack the file to get to the midi and audio stems, which you could then import into your own DAW (digital audio workstation). It’s a little bit complicated but might be worth it if your music is trapped on an iPhone and you want it in another format for future use. You cannot copy the file to Windows and move it though, you have to sync to the Mac (or maybe use iCloud).